Paxton Pits Nature Reserve is a rich mosaic of wildlife habitats covering 78 hectares of lakes, riverside, meadow, reedbed, scrub and woodland. 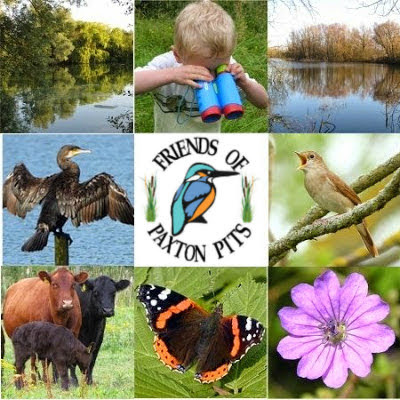 It is situated in the Great Ouse valley between St Neots and Huntingdon, and run by the Friends of Paxton Pits and Huntingdonshire District Council. It relies on you, its visitors and enthusiasts, for raising funds to improve the facilities and habitats for wildlife. Famous for its nightingales and cormorants - and host to a wide variety of other birds, insects, mammals and flora - you're sure to have a great experience whatever time of year you visit us. The Visitor Centre is open most days for refreshments, books, maps, leaflets and friendly expertise from the Voluntary Wardens. It also hosts a wide range of events and activities organised by the Friends throughout the year. The Reserve is also home to the Wildlife Trust for Bedfordshire, Cambridgeshire and Northamptonshire's thriving Environmental Education Centre. The Trust run events for children and families, giving everyone the chance to get involved with wildlife whatever their age. All day, every day. Parking is free. What a great looking... whatchamacallit! Lower than usual water levels in September and October has led to some fantastic birdwatching, as Trevor Gunton explains..
"Back to Nature" "Lovely walks and wildlife" "Nature as it should be" "Great for the Soul" "Beautiful walks..." "Lovely extensive nature reserve...great place for a walk" "Another great visit" "Lovely place" "Peace and tranquillity"